Have you used your grill yet? We've been using ours quite a lot lately. Charring up some food on the grill is a great way to have tasty food that is healthy, too. You don't need a lot of extra fat when you grill so it's a nice way to eat good food and feel good about what you eat. This grilled way of life doesn't only apply to meat and vegetables though. Grilling fruit is a great alternative for a simple dessert. 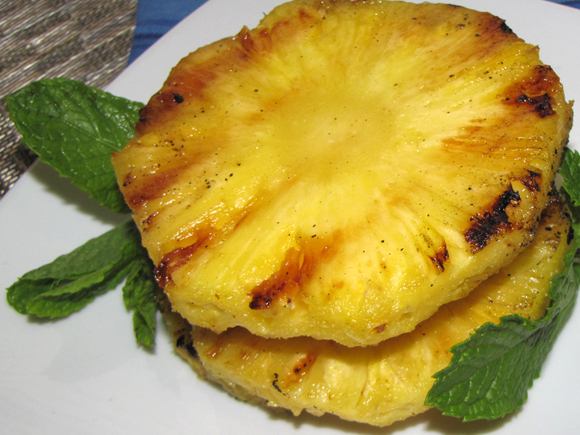 There are a lot of fruits that can be grilled, but one of the easiest and sturdiest is pineapple. It has so much flavor and is a great finish to any meal. 1. Cut top and bottom ends off the pineapple. 2. Stand the pineapple up and cut the skin off in strips. Cut deep enough to remove most of the eyes but not so deep that you remove too much of the flesh. 3. Remove any remaining eyes. 5. Mix remaining ingredients together and place in a zip-top bag with the pineapple slices. 6. Move the slices around until they are all coated. 7. Remove from the bag and grill over med-heat until the slices are nicely marked. 8. Cut out the core before serving if you'd like.